The Samsung Galaxy S4 has a split personality – it’s either powered by a Snapdragon 600 chipset (the I9505) or by Samsung’s own Exynos 5 Octa (the I9500). It took a while before it became clear which model goes to which country, but now it’s time to find out the answer to a more important question – does it matter? Typically, Samsung uses Qualcomm chipsets for its US models (due to the chipsets built-in LTE support) and sold their Exynos smartphones elsewhere. Now, the situation is different and the Snapdragon-based model is more common, perhaps due to low manufacturing capacity for the new eight core Exynos chipset. We have to admit we initially found the Exynos 5 Octa model more appealing, as it promised the holy grail of mobile computing – tons of computing power from the four Cortex-A15 cores and low-power usage when the four Cortex-A7 cores take over. Note: The results of the Exynos 5 Octa based Galaxy S4 (the I9500) are marked in red, while those of the Snapdragon 600 based model (the I9505) are in yellow). There’s more to power usage than just the CPU cores though as the call test shows. It seems that Samsung still has some way to go before its chipsets match the power efficiency Qualcomm delivers (the company is a market leader for mobile modems for a reason). Not that 11 hours of talk time on a single charge we got from the Exynos S4 is bad, but a difference of over 60% is massive. The web browser test gives the CPU something to do, but the result comes out almost equal – there’s less than half an hour advantage for the S600 model. Our web browser test is more intensive than casual browsing, so you might be able to squeeze out more than 7h of browsing out of the I9500 Galaxy S4. Surprisingly, video playback also went in favor of the I9505 and by a full hour, too. It’s still in the Top 5 (the iPad mini doesn’t count since it’s a tablet), but since we test with an SD video, the chipset would have been anything but heavily loaded. Perhaps a more efficient hardware video decoder in the Snapdragon trumps the power saving of running on Cortex-A7s. Standby power usage turned out to be about equal for both versions of the Samsung Galaxy S4, but the extra endurance the Snapdragon-based I9505 had in the three tests give it a higher endurance rating. 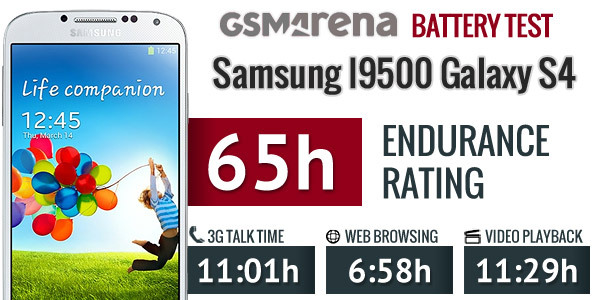 The I9500 and its Exynos 5 Octa chipset scored 65 hours, down from 69 hours for the I9505. The endurance rating shows how long a phone can last between charges if you do an hour each of calling, web browsing and watching videos. In practice, both versions will probably give you about the same time between charges as the battery of the I9505 will be very low over those last 4 extra hours. 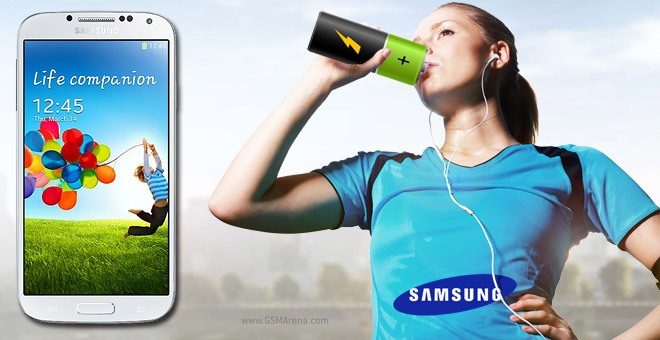 Unless you are a heavy talker that is – long calls on a 3G network will drain the I9500 battery noticeably quicker. Other than that, the Samsung I9500 Galaxy S4 is still one of the best performers in terms of battery life.